Sometimes a single event can alter the course of a person's life. For Lucy Marinn, everything changed when her younger sister, Alice was rushed to the hospital with meningitis. Overnight, the dynamic of her family shifted. Seven year old Lucy became the responsible daughter while Alice was coddled; her every need met, every misdeed excused. But while that fateful day re-defined the roles of the members of Lucy's family, it also introduced her to that which would become the passion of her life: the mystery and magic of glass. Now an adult, Lucy is a successful glass artist in Friday Harbor on San Juan Island off the coast of Washington where she lives with her boyfriend. She's had a rocky romantic history - she admittedly has trust issues - but is happy and secure in her relationship with Kevin...until the day he blindsides her with the news that he wants her to move out so he can move on with his new love: her sister, Alice! Lucy moves in with friends and attempts to heal from this double betrayal. As you can imagine, this is the worst possible time for a new man to enter her life which is, of course, when she meets Sam Nolan. A local vineyard owner and wine maker, Sam is one of the good guys. With a hunky body, nerdy brain, great sense of humor and heart as big as the ocean, he's a loyal friend, generous lover and dedicated bachelor. Growing up with alcoholic parents has soured him on marriage and convinced him that he's not husband and father material though anyone who observes him with the young orphaned niece he's helping to raise would disagree. Still, it's what Sam believes that drives his life and, ultimately, his relationship with Lucy. When Lucy is injured in an accident and her friends are unable to care for her, Sam brings her to recover at the house he shares with his brother and niece. The enforced proximity gives Lucy and Sam the opportunity to get to know one another without the expectations or pressures of a dating relationship. As their friendship deepens; as secrets are revealed and dreams are shared, their feelings for one another also grow and deepen, with vastly different reactions. Will they be able to overcome beliefs and fears deeply rooted in their childhood experiences and give love a chance? One of the things I most enjoy about Lisa Kleypas is her ability to create realistic family relationships. Sam and Lucy are products of their family experiences, both good and bad. Issues are not sugar coated but are expertly woven into the fabric of their lives, making them complex, interesting people. I liked them both. I ached for them, laughed with them; cheered for the fulfillment of their dreams, their love, their happiness. The secondary characters only add to the charm and complexity of this story. From goodhearted bikers to loyal girlfriends to family members who we love even when we don't like them very much; they add depth to the story while providing insight into the two main characters. I hope we'll see some of them again in Crystal Cove, Sam's younger brother, Alex's story. From the setting to the characters to the touch of magic that filled my heart with a sense of wonder, Rainshadow Road has earned a place on my keeper shelf where, like a treasured friend, it will be valued and visited often. Disclaimer: I am one of "Lisa's Divas" - a group of select fans who share info and content related to Lisa's novels and get sneak peeks and swag. However, every review that I write, whether I purchase the book or receive an advance copy from the author or publisher, reflects my unbiased opinion. "Lucky 75" who received the book. I am very much looking forward to reading "Rainshadow Road." and the following books in this new series. I believe I will enjoy reading RAINSHADOW ROAD - love the name. Flora, though I've loved Lisa's earlier contemporaries I have not had the chance to read the first book in this series (Christmas Eve at Friday Harbor) so Rainshadow Road was my introduction to this new fictional world she's created. Isn't that a great name, Marybelle? I hope you enjoy the book as much as I did! I've always enjoyed her Historical romamnces. I will look for RAINBOW ROAD. Another great review, PJ, and--as is so often the case--one with which I am in total agreement. :) I loved Rainshadow Road and eagerly await another visit to Friday Harbor. Laurie, I highly recommend Rainshadow Road! Janga, I read your review after posting mine last night. I wasn't a bit surprised to discover how close our opinions were. Like you, I loved this book and have already marked my calendar for Alex's story in August! i don't know, after read so many book of lisa kleypas, which i know that her book iss so fabulous and i am a big fan of her book but i don't think this series (i'd read christmas eve at friday harbor) will be my fave series. Wonderful review, PJ! Lisa Kleyas is an author I never miss and this sounds like another winner from her! Great review PJ! :) I can't wait to read Sam and Lucy's story!!! I enjoyed Christmas Eve at Friday Harbor and am looking forward to a return visit. Lisa is a fantastic author, and she never fails to deliver. Awesome review! I'm headed over to Amazon to add this now. What a great idea. Bits and pieces of this are things that many of us can relate to. Maybe not to this extent, but I still see some of the childhood competitiveness that was always present with me and my sisters. Can't wait to read the story. I have only read a few of Lisa's books but really enjoyed them, must get more of them. Thank you for the review! 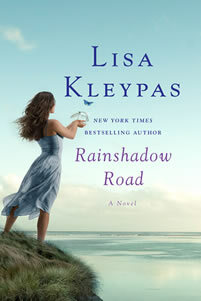 Lisa Kleypas is one of my favorite authors, and I can't wait to read RAINSHADOW ROAD. The release date can't come fast enough! Thanks for the review, PJ. I'm one of Lisa's Divas, but I didn't win an advanced copy. I'll just have to wait another month. The book I'm really looking forward to reading is Alex's story. From his introduction in Christmas Eve at Friday Harbor, Alex appears to be an intriguing character. Eli, as I mentioned earlier, I haven't read the first book in the series yet so I can't comment on that. I loved this book though. It's Kleypas at her best! Andrea said, Lisa Kleyas is an author I never miss and this sounds like another winner from her! As far as I know, she doesn't! Tami, one of the things I most enjoyed about this book is that it's so realistic and included situations with which I could easily relate. Virginia said, I have only read a few of Lisa's books but really enjoyed them, must get more of them. Oh, you have so many wonderful stories ahead of you! Hope you enjoy it, Amber! Penfield, you get to see more of Alex in Rainshadow Road; enough to make me want his story now! Oh, I cannot wait to read this one!!! I met Sam in 'Christmas Eve at Friday Harbor' - can't wait to read his story! Great review, PJ. I'm looking forward to reading this one. PJ, Thank you for another excellent review. Whether you beolong to a group or not, I have found the reviews here on the Dish the ones I look forward to and trust. This sounds like it will be another good series by Lisa. I look forward to reading it. Love your review I cannot wait for this book to come out...I love lisa's books!!!! I read Christmas Eve at Friday Harbor a few weekday ago and I am dying for Rainshsdow Road! Great review, PJ!